Nanocrystalline CeO2-doped (5, 7.5, 10, and 15 mol%) Gd2O3 powders, with a particle size of about 17 nm, were synthesized through the combustion of glycine/nitrate gels. Dense nanocrystalline materials were obtained by hot uniaxial sintering. Optical microscopy, scanning electron microscopy and transmission electron microscopy examinations, as well as X-ray diffraction analyses, have allowed us to characterize these polycrystals. The grain sizes, included between ∼10 and 80 nm, depend on both the sintering temperature and the amount of dopant. A comparison of the transport properties of these nanocrystalline samples to the values obtained with coarsened grained materials of same composition shows that the ionic conductivity passes through a maximum for mean grain sizes included between 300 and 500 nm. Furthermore, an enhancement of the ionic conductivity is observed when the amount of dopant increases. This was attributed to a grain-size-dependent gadolinium segregation at the periphery of the grains confirmed by X-ray photoelectron spectroscopy characterizations. 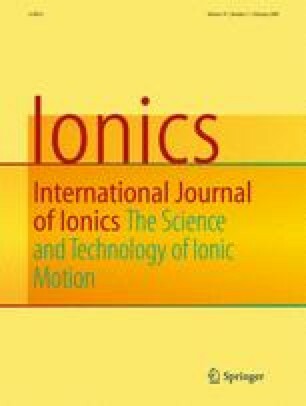 Paper presented at the 11th EuroConference on the Science and Technology of Ionics, Batz-sur-Mer, France, 9–15 Sept. 2007.